Back in March, the start of MotoGPTM signaled a new, exciting season of Moto3, Moto2 and MotoGPTM racing action: KTM is READY TO RACE in all classes. Just like in previous years, the best riders in Grand Prix motorcycle racing are, once again, demonstrating motorsport at its finest, providing some truly breathtaking viewing over a total of 19 races. 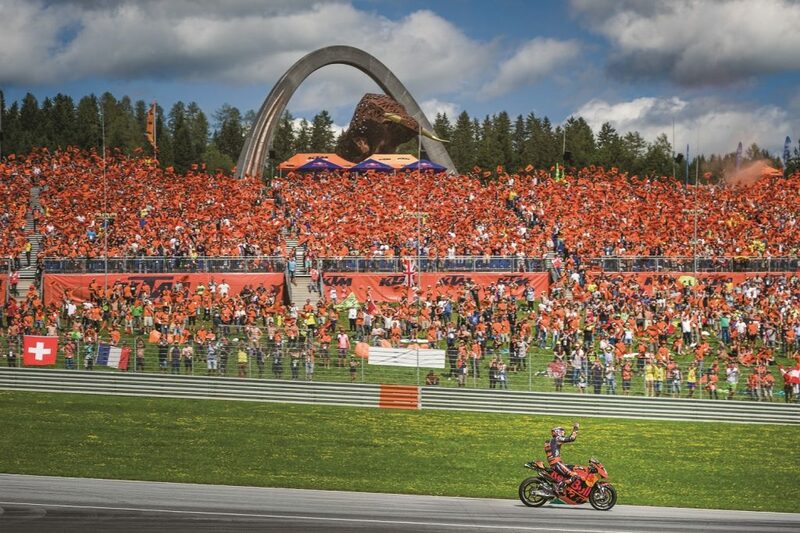 With the KTM FAN PACKAGE, the Austrian manufacturer is offering all enthusiasts the opportunity to watch the premier class of motorcycling live in action at selected European races. READY TO RACE is more than a slogan at KTM; it’s a way of life. It’s therefore no surprise that KTM is rising to the challenge in all three classes of Grand Prix motorcycle racing. After a strong Moto3 season in 2017, KTM has really upped its game for 2018 in the smallest class, hoping to improve on its successes from previous years. In Moto2, the chassis developed in collaboration with WP exceeded all expectations in its debut season, especially towards the end of the year, and has already managed to secure its first podium places in 2018. The Red Bull KTM MotoGP Factory Racing Team, featuring factory riders Pol Espargaró and Bradley Smith, has been creating a buzz by exceeding all expectations with the KTM RC16, securing good qualifying results in their first MotoGPTM season, as well as regular top ten results and World Championship points. Standings in the points table at the start of the season mean that it’s already looking good for a successful second season for the KTM works team. Further information and details about the KTM FAN PACKAGES are available here.